Reservations canceled within 30 days of the scheduled arrival date are subject to a 40% penalty of the entire stay. Reservations canceled within 15 days of the scheduled arrival date are subject to a 75% penalty of the entire stay. From Sevilla Airport, it is 90 km. Take motorway AP-4 from Sevilla to Cadiz; take exit 101 to Puerto Real. At the first roundabout, take road CA-3113. On kilometer 3.300 at the right-hand side is the entrance with a sign reading "Dehesa de las Yeguas". From Jerez Airport, it is 25 minutes by car. From Malaga Airport, it is 200 km. 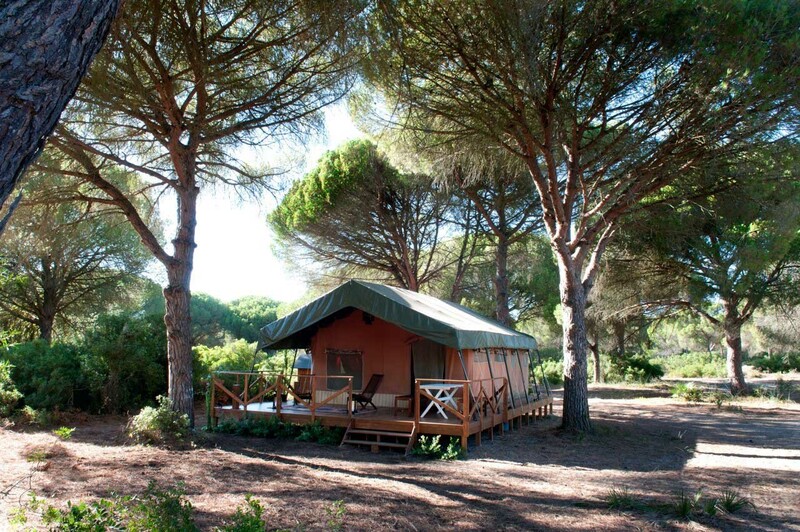 The luxury safari tents are situated in the Natural Reserve "Parque Natural de la Bahia de Cádiz". The 460-hectare family finca "Dehesa de las Yeguas" is surrounded by a unique, botanique, Mediterranean pinetree landscape. In this land, our ancestors bred brave bulls ("toros bravos") and horses. The finca is a place where you can adore the pure nature and peace of the Andalusian countryside while enjoying the comforts of the luxury tents. The two luxury safari tents are located 300 meters from the main house in the middle of a pine forest. They are built upon wooden platforms 50 cm above the ground. Each tent is 50 square meters in size, including a 15-square-meter veranda and 35-square-meter interior. Each has a complete bathroom, well-equipped kitchen, dining room and one or two rooms. All you will hear is the sound of the wind and the birds—a completely relaxing area, full of privacy. The luxury safari honeymoon tent is located 300 meters from our main house in the middle of a pine forest. It is anchored perfectly to the ground and built upon a wooden platform 50 cm above the ground. Each tent is 50 square meters in size, including a 15-square-meter veranda. It has a complete bathroom, well-equipped kitchen, dining room and a single bedroom. Best time to travel is during the spring or autumn. The landscape is full of flowers and new plants, all green. During autumn, with the first rain, is another very special time of the year. It is an ideal destination for families and couples! Beautiful Cadiz beaches are only 8 km away. It's a unique place where you will always want to come back.